Would Access to 15,000 Libraries Help Your Book Promotion Efforts? At the end of July we wrote a post, Have You Overlooked Your Local Library? 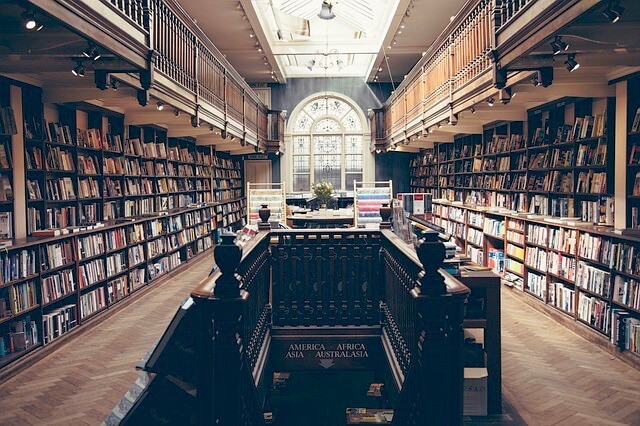 Apparently many of us have; we visit too many libraries that are ghost towns, but more and more community leaders and savvy folks in publishing (yes, including authors!) are working to keep libraries a focal point for learning and art. And we all need to participate in that, to teach the next generation how to love the quiet, to love the shelves full of so many words (and pictures) from a universe of teachers and artists, and especially to love that particular, comforting, inspiring scent of old books mixed with newly minted ones. What is of concern to us at WWW is how few authors bother to reach out to more libraries to build their readership! We’re seeing some progress, thanks to programs like Library Journal’s Self-E program. And we’ve heard back from a few authors, and excited to hear they’ve used libraries for book-signings. Really clever among the comments we received: using the library facility and staff to host the signing, and a local book store and their staff to offer books for sale (that’s brilliant!). We’ve heard from others that they’ve connect with their own library, but are unsure how to move on to other libraries in their city, county, state, region. Well, our newest WWW project will help! 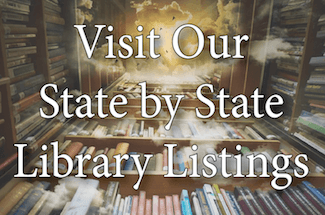 State-by-State Library List: It’s HERE! Click the link above or HERE (and we’ll soon have a widget up on site to easily get to your library list). Choose the state you’d like to view libraries in (see illustration below for how to access various states). 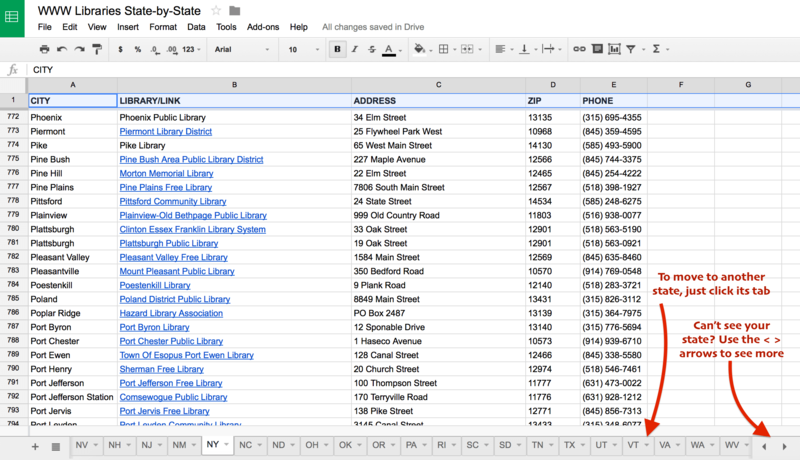 You’ll see the libraries are sorted by CITY in each state (and Washington, D.C.). You’ll also see the names are live links to the library website, or in some cases, the local government agency hosting the library’s info. We’ve also given you the phone number for each so you can (and we encourage this) make personal contact. With over 15,000 libraries listed in these pages, (tons of which have local reading discussion groups and are eager to host more events that bring in more members of the community) there’s no excuse to not reach out to this incredibly useful treasure trove of influencers! Now, tell us, how are YOU reaching out to libraries? ← Pinterest Update: More Ways Authors Can Use Pinterest! As a reader, my city library has always been a big part of my life. As an author, it’s helped me develop my brand locally by inviting me to do a book signing for my novel, which drew a small but interested audience and several books were sold. The folks there also allowed me to teach a class on self-publishing which I continued to develop and now teach several times a semester at two area colleges. Most importantly, I approached last year them with an idea to host a local authors and illustrators showcase and they agreed. Our first event featured 19 authors/illustrators and our next event on September 26 will have 31! This is now the library’s signature event. I’ve also been accepted into Library Journal’s Self-e program. The library is a great place, although I must admit I have not had much success with libraries outside my hometown. I visited my local libraries and was happy that they listed my book in there catalog. I now have 5 libraries that carry my listing in their catalog. I sent out letters to other libraries that were to far to visit but have not heard back. Maybe some ideas about might get their attention in follow up letters. What are your suggestions to get replies? Thank you for illuminating this source. It surely will contact with readers. Thanks, Nancy – and stay tuned for that article! Super helpful. I’ll use it! Thanks so much. I have done the book presentation and signing at my local library. About 40 people came and I sold about 25 books. It was wonderful! Outstanding, Margaret! And exactly what authors who think libraries are “just about free” need to know and understand. Thanks for this and report back on your continued success! I have written a book on quitting smoking that I would love to get in to libraries particularly school libraries: high schools and universities. Public libraries are fine too but I believe there is a real opportunity for me in public school and university libraries. Do you have any information on how to access that market? Thanks Shari. I look forward to working with my local branches. I’ll let you know how it goes. Thank you, Flora – And good luck – we need more astute authors populating our nation’s libraries – think it would encourage the general public, too… while creating buzz for authors. My mother’s a librarian up outside Chicago and they’re always looking for new faces and author events! Wow, wow, wow! What a list and a lot of work in sorting through and linking it all. Great work, Matthew and Delaney. They’re the BEST, thank you Kelly! Now, go pitch some libraries, sister!